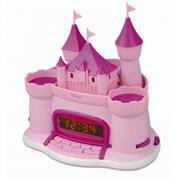 Your daughter can wish on her own star with this Disney Princess Alarm Clock Radio. This item projects a star pattern on the ceiling, adding a whimsical touch to your child's room. This clock radio with projector also has all of the essential functions of a clock radio, including a snooze button, three choices of sounds to wake up to and a radio tuner. The radio features an analog AM/FM mono radio station and rotary volume control for the alarm function. It includes two speakers. The clock also includes a battery backup option in case of a power outage.